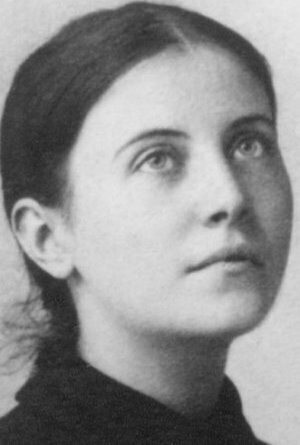 St. Gemma Galgani was born Maria Gemma Umberta Pia Galgani on March 12, 1878 in Camigliano, a village close to Lucca, Italy, to Henry (a pharmacist) and Aurelia Galgani. She was the fifth of eight children. Gemma lost her mother to tuberculosis on September 17, 1886, when she was 7 years old. It was her mother who first made her want to go to Heaven – Gemma was confirmed on May 26, 1888. She studied in school at the Institue of St. Zita, under the instruction of Nuns (The Oblates of the Holy Spirit). While at the Institute, she wished badly to receive her first Communion, but was so bad and ignorant that the Nuns discouraged her from it. Though Gemma’s behavior became worse, the Nuns, knowing her deep desire, and having given instruction and Catechesis on it, granted her request. Before receiving her first Communion she was able to get the permission of her father to spend some time at the convent to prepare. While in the convent, she went to the chapel to thank Jesus for this grace, and seeing the crucifix, she remembered being told that Jesus had died on the cross for men. She ardently desired to know all about the life and Passion of Jesus. She received Catechesis on this from her teacher, Sister Camilla Vagliensi. When her teacher taught about the Passion of Jesus, Gemma was so overwhelmed with sorrow and compassion that she broke a bad fever. Her teacher taught her in more brief segments after that point. She made a general confession and received her first Communion (sufficient evidence shows) on June 19, 1887. As soon as I left him (Jesus), I began to feel proud, more disobedient than before, a bad example to my companions and a scandal to all. At school, not a day passed on which I was not punished. I did not know my lessons and I was almost expelled. At home I would not let anyone have peace. Every day I wanted to go for a walk, always wearing new clothes which my poor father provided me for a long time. I ceased to say my usual prayers morning and evening. But while I was committing all these sins I never forgot to recite every day three Hail Marys with my hands under my knees (a practice me mother had taught me that Jesus might protect me every day from the sins against holy purity). Gemma says that in her bad behavior, all she had left was her charity. She would give money or, if it was refused and she did not have any, she would take food from her home to give to the poor. She gave clothes to those who came to the door. Her confessor forbade her to continue doing such things. She obeyed and this resulted in her staying in the house because the poor would come to her if she went out, and it pained her greatly that she had nothing to give to them. In staying home, she grew tired of “clothes and everything else,” and in this way grew in virtue. Gemma says that she “was a bad example to her brothers and companions.” She says she was arrogant and short with her aunts when they corrected her. She says she was especially prideful as her teacher frequently called her “pride personified.” She would think on how her sins offended Jesus and this would cause her to work and study harder. Her teacher at the time of her retreat reproved her gently, little by little and she continued her growth in holiness. Gemma went on retreat at the convent (held every 2 years, open to external students) and Gemma, after meditating on sin, came to realize that her sin should make her worthy to be despised by all. She says “I saw myself to be so ungrateful to God, guilty as I was of so many sins . . . then we made a meditation on hell, of which I knew myself to be deserving . . . I made this resolution: I will make acts of contrition during the day, especially when I have committed some fault.” During the last days of her retreat, they considered Jesus’ example of humility, meekness, obedience, and patience. 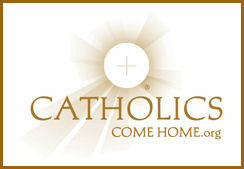 At the end of her retreat, she got permission from her confessor to receive communion and confession 3 times a week. Gemma desired and was granted permission by her confessor to make a vow of chastity on Christmas night of 1896. In 1897, her family struggled greatly. They were deprived of all means of livelihood and her father was seriously ill. He died on November 11, 1897 at the age of 53, and God then took the role of both her heavenly and earthly father. Her family then had only enough to live on. She went to live with her Aunt Carolina Galgani, going to daily Mass but seldom receiving communion because she did not want to go to Confession with anyone but her regular confessor. She began to forget Jesus, neglected to pray, and sought diversions. She became good friends with another neice living with her Aunt and tthey became very much alike in their wickedness. Gemma says that she became very worldly, committing sins of every kind, but Jesus came to the rescue in giving her sudden and terrible back pain. She went back to Lucca. While ill, her family and friends of the family were saying many prayers and devotions for her healing. Gemma was brought a book by a lady who frequently visited her, titled “The Life of Venerable Gabriel.” (Now St. Gabriel of the Sorrowful Virgin, a Passionist). Gemma thought little of it, but her family began a devotion to him. On a day in which she was alone, she was attacked by strong temptations. Gemma remembered Venerable Gabriel and she said “the soul comes first and then the body!” The attacks grew stronger and with the help of Venerable Gabriel, Gemma conquered. Her devotions to him grew deeper to him. Gemma eventually had to give the book up which was beyond difficult as she slept with it under her pillow – he brought her such comfort and strength. Venerable Gabriel rewarded her for her devotion by coming to Gemma in a dream. He said he would return, but he did not come for many months. After this time, the Sisters of Charity came to tend to Gemma and change her clothing. Gemma thought to herself, “Tomorrow is the feast of our Blessed Mother. If I should promise her that if she would cure me I would become a Sister of Charity, what would happen?” Should this have happened, everything was set and her confessor gave permission for this. All that was left was to make her promise the following day. Gemma and her confessor both made a vow of virginity (he renewed his and she made hers). She slept in perfect peace, but shortly she saw Venerable Gabriel, who said to her, “Gemma, make the vow to become a religious gladly, but nothing else.” After asking why, Venerable Gabriel touched her forehead, smiled and said to Gemma, “My Sister!” Gemma did what Venerable Gabriel had asked of her. The same thing happened for nine nights (The person appearing to her was Venerable Gabriel). The novena ended on the first Friday of March, and Gemma went to Confession and received Holy Communion. Gemma was cured! Jesus was so tender to Gemma. She realize this and in her discouragement about having lost her earthly parents, Jesus said to her that he would be her Father and our Lady of Sorrows to be her Mother, and that she was their daughter. Gemma realized how cold and indifferent she had been to Jesus. Gemma had an unbearable hunger for Holy Communion, and her Guardian Angel became her master and guide in her in becoming holy. After some time, Gemma was finally able to go to her first Holy Hour where she did not have to stay in bed (due to weakness). This was on Holy Thursday in 1899. She wept greatly and had deep sorrow for her sins, all of which she recollected. All of a sudden her strength failed, and she struggled to get up to lock to door to the room. Gemma found herself before Christ Crucified, Jesus bleeding all over. Gemma made the sign of the cross and a deep peace filled her. She felt more sorrowful over her sins and could not bear to bring herself to look at Jesus. She prostrated herself, remaining there for several hours. Jesus said to her, “My daughter, behold these wounds. They have all been opened for your sins. But now, be consoled, for they have been closed by your sorrow. Do not offend me any more. Love me as I have always loved you. Love me.” Jesus repeated this to her many times. When the vision vanished, from that point on, Gemma abhorred sin (Gemma says this is the greatest grace given to her). Gemma desired to ardently to love God, and love him perfectly. Jesus appeared to her on Good Friday to ask her to be his spouse, and later to say to her, “…Do you really want to love me? Then first learn to suffer. It is by suffering that one learns to love.” Jesus appeared to her during her Holy Hours to give her a share in the grief he experienced in the garden at the sight of her sins and those of the entire world. The time eventually came for Gemma to go visit the Monastery of the Visitandines. She received permission to “test” herself in the religious life with their order by living their schedule for the time that she was there, and she did not like it as she found it to easy – she wanted to do penance. Still, Gemma did not want to return to the World, but she did, on May 21, 1899. She wanted to become a religious so badly that she was ready to just become a Visitandine nun, and they were ready to accept her in June of 1899. On June 8, 1899 (The octave of Corpus Christi and vigil of the feast of the Sacred Heart), Jesus told Gemma she would receive a great grace. Gemma was at her home. In the evening, Gemma felt a deep sorrow for her sins, deeper than she had ever felt before, and it brought her close to death. She recalled all her sins and the offence they gave to God. She saw all the torments Jesus endured to save her. Gemma found herself before the Blessed Mother and her Guardian Angel, who told her to make an Act of Contrition. The Blessed Mother said to Gemma that her sins were forgiven and asked Gemma if she would be her true daughter (in order to receive the great grace). Mary covered Gemma with her Mantle and Jesus appeared with his wounds open and fire issuing forth from them. They pierced Gemma’s hands, feet, and heart. Gemma had received the Stigmata and she was filled with perfect peace. The Stigmata was repeated every Thursday around 8pm. Gemma still desired greatly to become a nun and Jesus commanded her to hide this desire in his heart and so one could take it from her. Jesus reproved her often, but was merciful, ever merciful. Gemma went to a retreat in the Church of St. Martin, from June 25-July 9, 1899, preached by the Passionist Fathers: Cajetan, Adalbert, Callistus and Ignatius. Jesus asked her if she liked what the Priests were wearing (The Passionist habit) and if she would like to be clothed with that same habit. Gemma exclaimed “My God, Yes!” Jesus commanded her to go and reveal everything to Fr. Ignatius. Gemma struggled so much that she could not bring herself to share her soul and instead of going to Fr. Ignatius, she went to Fr. Cajetan, who listened with “infinite patience” and promised he would return to Lucca and would have more time for her confession. She went to him for confession for a few times, and Fr. Cajetan, at Gemma’s request, gave her permission to make her vows of chastity, poverty, and obedience from July 5 to September 8 of that year. She revealed to him things that she had been doing without the permission of her regular confessor, and he commanded her to cease doing them as she should have the permission of her confessor (Fr. Cajetan knew her confessor, the Monsignor, although Gemma was not aware of this initially). Fr. Cajetan said he could not property direct her and she had to see her confessor. The Monsignor was in support of everything Fr. Cajetan had given permission for, and he added an additional vow of sincerity, also saying that the matters of her soul are to be shared with himself, but she may go to Fr. Cajetan for confession whenever she wished. St. Gemma died from tuberculosis on Holy Saturday, April 11, 1903. She was Beatified on May 14, 1933 by Pope Pius XI and Canonized on May 2, 1940 by Pope Pius XII. Her Feast day is April 11 (or May 16th for the Passionists), and she is the patroness of pharmacists, loss of parents, those suffering back injury or back pain, those suffering with headaches/migraines, those struggling with temptations to impurity and those seeking purity of heart. ST. GEMMA GALGANI, PRAY FOR US! !